One week to Valentine’s Day! Do you guys have anything up your sleeve? We decided that we are not doing a big night out or gifts this year. We are planning two big trips for 2019 and we want to save up our money for that. We said we will each make a deposit to our vacay fund instead of gifts! I think we are going to stay home with the pups, make homemade pasta and have a netflix binge-athon! We may also go down to Atlanta the weekend after V-Day, there’s a restaurant there we’ve been wanting to try. If we were doing gifts, here are some of the Valentine Gift Ideas I would be using for bubs! 1. Amazon Cloud Cam $99 // If you follow along on here often, you probably know we are in the process of creating a smart home! I enjoy it and RJ really enjoys it. I think he feels like he’s truly living in the future, ha! My good friend raves about this cloud cam and I’m wanting to add one to our living room. 2. Ring Doorbell $99 // We got this for Christmas and both RJ and I are obsessed! It is so nice being able to see who’s at our door and even activity on our street. I don’t know how we lived before this doorbell (dramatic but also kinda true). 3. Ray-Ban Pilot Sunglasses $178 // I want these for RJ but I think I also just want to steal them for myself too. I think these are so cute and retro looking, I’m in love! RJ and I said we weren’t doing gifts this year but I may have to order these for us to share. 4. Outlets with USB port, Set of 2 $23 // These are so simple yet so smart! I especially love these for your kitchen. 5. Crosley Record Player $125 // I think I share this every Valentine’s Day but it’s truly one of my favorite gifts! It is so fun for both RJ and me because we can enjoy it together, go to an antique store looking for records together and even gift each other records for special occasions. I also think it’s sleek and chic for home decor too. 6. Leather Airpods Carrying Case $19 // Ok, ok. I said we weren’t doing gifts this Valentines but I had to order RJ these. They’re such a great price, I love the leather and I know he will be obsessed! He loves his airpods and this will keep them handy. 7. Bose Micro Bluetooth Speaker $79 // You can’t tell from the photo but this speaker is tiny! It’s about the size of a cookie and it’s so cute. It is portable and waterproof, perfect for the shower, pool, beach or on the go. 8. Charging Station $38 // How handy is this?! I love how sleek it is too, it won’t bulk up your nightstand. 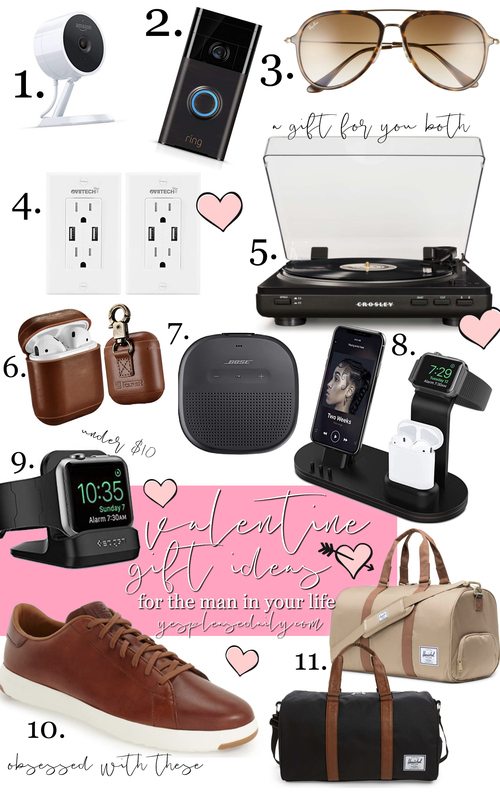 This is perfect for the tech-loving man in your life. 9. Apple Watch Dock $9 // The smaller version of the charging dock above, this is the perfect easy gift! If you want to do something big, pair with a new Apple Watch. I have a charging dock for my apple watch and it is seriously a game changer. 10. Cole Haan Leather Sneakers $130 // Another thing I wasn’t going to buy but now I’ve fallen in love with. RJ loves wearing sneakers but these are so nice, they can easily be dressed up too! They come in multiple colors but I’m loving the cognac brown. 11. Novel Duffle Bag $85 // RJ has a duffle and backpack that he uses while traveling and he loves them both. This one is super similar (don’t tell him but I actually like this one better). This one has a bottom compartment for shoes, so they don’t get your clothes dirty!